From the ESA website for the Hubble space telescope. The smile, however, is an optical illusion. The lines are actually arcs created by a galaxy cluster. Such phenomena occur when a very massive object (and galaxy clusters are the most massive objects in the universe) is located between the distant source of light and the observer. The object deflects the “incoming” light from its original path, thus acting like an enormous gravitational lens. 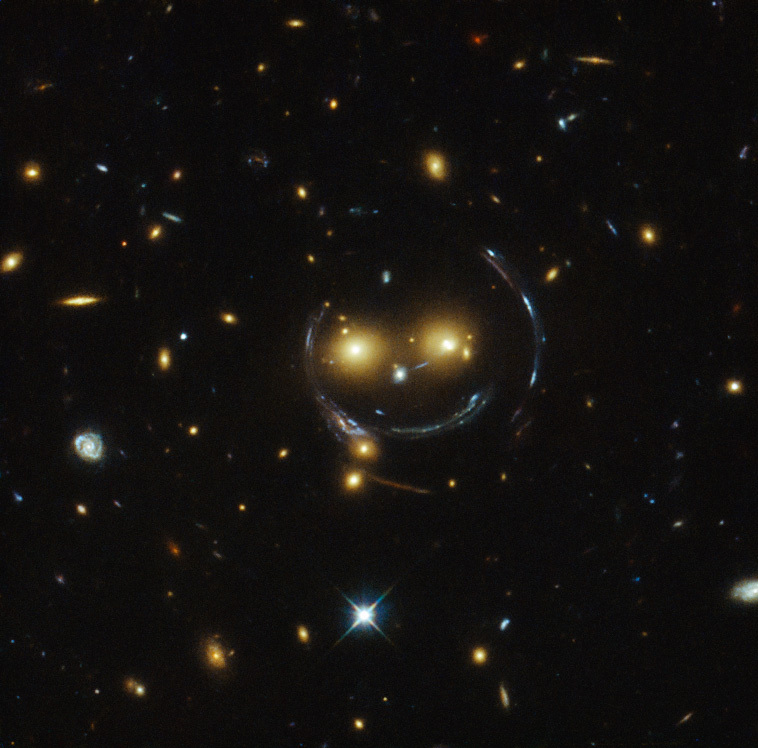 The smiling image is a special case of gravitational lensing, known as Einstein ring. When light coming from a distant source (such as a galaxy) passes through a strong gravitational field (created, for example, by another galaxy), the light is deflected from its course. To an observer, that light appears “bent”, as if it passed through a lens. If the source galaxy, the “lens” and the observer (in this case the Hubble Space Telescope) are aligned almost perfectly along the same line, the light rays from the faraway source will be bent all around the lens, forming a full Einstein ring. In 1801, the astronomer von Soldner calculated from astronomical data the scattering of light-particles by the Sun according to Newtonian scattering theory. Einstein, who did not know of von Soldner’s work, became aware that gravitation caused the bending of light in 1907. At that time, Einstein thought only of terrestrial experiments as a means of observation, and therefore concluded that these would be too hard to perform. By 1911, Einstein realized that deflection of light by the Sun could be detectable. The value he calculated was quite close to the one von Soldner found. To form a gravitational lens, a distribution of matter (such as a cluster of galaxies) has to be located between a distant source and an observer. It acts like a lens, because its strong gravitational field bends the light from the source as it travels towards the observer. Orest Chwolson published a paper about the effect in 1924, but the concept did not receive much attention until Einstein published in 1936 a brief note on the subject, in the journal Science. In the note, Einstein presented formulae for the optical properties of a gravitational lens, which he had derived some 24 years earlier. After Einstein published, the topic was followed by a number of articles by well-known scientists. According to Wikipedia, the first Einstein ring was discovered in 1988, and the first complete Einstein ring was discovered in 1998. This entry was posted in photos, physics and tagged Einstein, gravitational lens, History of physics, history of science, Hubble Space Telescope, smiley. Bookmark the permalink. Oh, that’s a great picture. I didn’t know there were any gravitational rings that looked so personable.